Hopefully this will be the last memorial for a while…. My friend Charlotte’s mom, Lynne, was the most amazing artist. There wasn’t a single art or craft that she couldn’t do and do well. She was the kind of person who would wake up one day and decide to suddenly start making stained glass windows. (my mom is a little bit like that too, although unlike Lynne, she has an Achille’s heel – origami of all things). I ended up with some of Lynne’s fabric and a feeling that I should do something. When I heard that Charlotte was expecting, I decided to make a baby blanket. 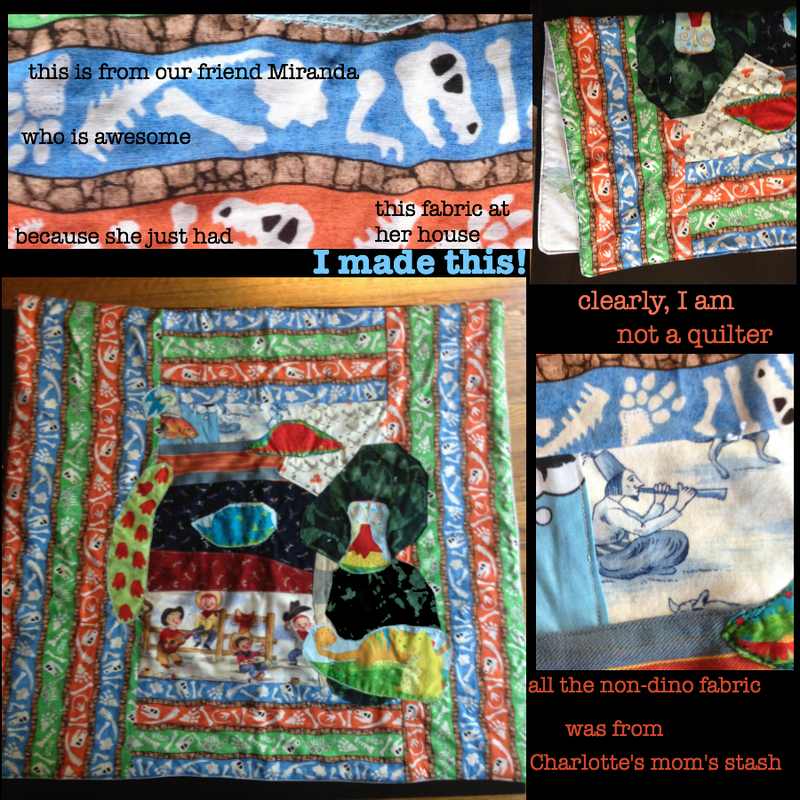 I am not a quilter nor the sort of artist that moms seem to be, but I managed. Almost all of the non-dino fabric is from Lynne’s collection; dinosaurs are the baby theme. The amazing stripy fossil fabric is from our friend Miranda – I love her because she’s the kind of person who, when you tell her you’re making a dino quilt, immediately proffers dino fabric. This entry was posted in Creativity, Goals. Bookmark the permalink.